Haldi (turmeric) is an effective herb and is mainly used in Indian cooking. Due to its antiseptic qualities, it is also used in many Ayurveda medicines. It also helps relieve pain in jaundice. 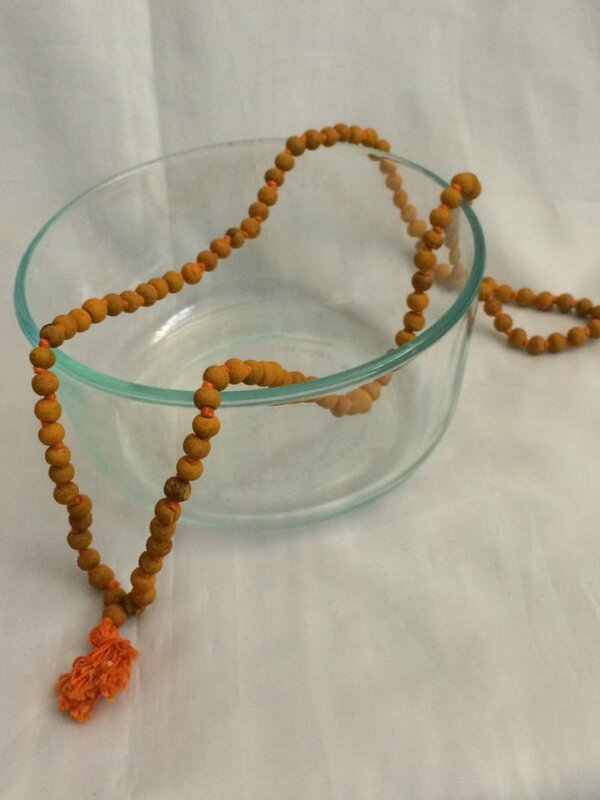 Haldi mala (Turmeric garland) is used worshiping, meditation or rituals at wedding. It is believed that wearing Haldi mala brings a peace of mind and a calming effect. This item in Hindu Puja Items category was first added to our catalog on 08-31-2015. Buy Haldi Mala, 30" with 108 Beads, sold & shipped by Namaste where you can shop online for Indian Gift Store: Handicraft, Home Decor, Wedding, Rakhi & Diwali Gifts. This Puja Samagri collection has been tagged as health, peace, religious gift, hindu religion, pooja samagri, meditation, spirituality, natural garland, traditional bead mala. Paan & Diya Pattern Dry Fruits and Chocolate Box 8"*8"